Glenn Luedtke received his musical education at the Peabody Conservatory of Music, majoring in percussion performance and music education. He studied timpani and percussion with Robert Kennick, William Sebastian Hart and Fred Begun. He also minored in trumpet, studying with former BSO principal trumpet Domenic DeGangi. In 1960 he joined the Baltimore Symphony Orchestra as a percussionist, performing under the baton of Peter Herman Adler, and with such guest conductors as George Szell, Leopold Stokowski, Leonard Bernstein and Kaptain Kangaroo. In 1964, Mr. Luedtke joined The United States Army Band (“Pershing’s Own”) in Washington, D.C., where he performed with the Concert and Ceremonial Bands, Herald Trumpets, Orchestra, Army Blues and Chamber Singers before retiring as a Sergeant Major following more than 20 years of service. During his military career, he was awarded the Meritorious Service Medal, Army Commendation Medal, Army Achievement Medal, Army Service Ribbon, National Defense Service Medal and Good Conduct Medal (6th award). Upon leaving the Army, Mr. Luedtke, a Nationally Registered Paramedic, joined the faculty of The George Washington University School of Medicine and Health Sciences as an Adjunct Assistant Professor of Emergency Medicine. He later became Director of Cape & Islands EMS in Cape Cod, Massachusetts, before moving to Delaware to accept the position of Director of Emergency Medical Services for Sussex County, retiring from that position in 2010. He has also been a frequent lecturer at regional, national, and international EMS conferences and symposia. 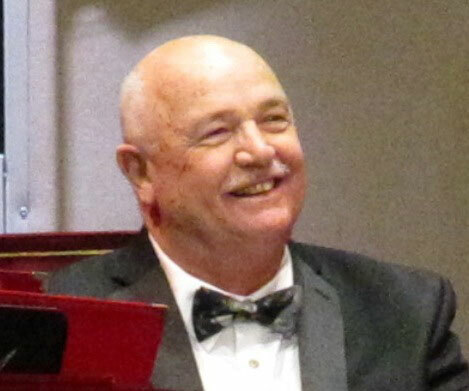 In 2014, Mr. Luedtke joined the Virginia Grand Military Band as Timpanist. He also performs on trumpet with the Salisbury University Pops, and is Principal Trumpet and Associate Conductor of the Milford Community Band. He is also Principal Trumpet with the Rehoboth Concert Band and “A Touch of Brass”, a local brass quintet, and frequently performs with pit orchestras in local theatre productions. Glenn and his wife Sherry live in Rehoboth Beach, Delaware. They have two daughters, two granddaughters, and a boxer/lab mix (a “Blab”) named Roscoe.